This is the economic idea that the best way to promote economic development is through promoting free trade and not providing direct foreign aid. A culture of dependency. Foreign aid to developing economies is invariably wasteful and can create a culture of dependency. Also, recipients of aid may feel lower self-esteem, which is damaging in the long-run. Milton Friedman argues that, whilst aid can increase capital in a developing economy, it is also likely “that they lead to a noticeable increase in the amount of capital devoted to economically wasteful projects.” (“Foreign Economic Aid: Means and Objectives” (1995), p.6 Stanford University. Aid given for bad motives. Aid is often subject to vested interests and fails to make real improvements in living standards. For example, government aid is often tied to bilateral agreements – aid to India with an expectation of demand for buying British exports. WIth private aid foundations, there is a concern that it gives power to unelected individuals in deciding priorities of societies. Trade increases welfare. Increasing trade is the best way for developing economies to improve their real economic welfare, and enable a sustainable increase in economic welfare. Most economists are united on the benefits of free trade to improve economic welfare. For example, US and EU tariffs on food, lead to higher prices of food for consumers in developing economies. Removing these tariff barriers would enable cheaper prices of global foodstuffs. This would make a real difference to economic welfare in developing economies. Also, farmers in developing countries would have more chance to export to the developed world. Further reading on benefits of trade. Success of trade in S.E.Asia. Supporters of ‘trade not aid’ point to countries in south east Asia who have been able to dramatically increase economic welfare through increasing trade. China has lifted record numbers of people out of absolute poverty through two decades of economic growth – largely driven by growth in free trade. Aid to China has played a very small role. Democratic costs. Foreign aid can disrupt political democracy in developing economies. Milton Friedman writing in “Foreign Economic Aid: Means and Objectives” (1995), notes that “many proponents of foreign aid recognize that its long-run political effects are adverse to freedom and democracy.” Aid may be given to prop up a government – and avoid a democratic change. It is arbitrary which groups receive aid. Foreign aid can displace domestic government incentives to invest in public infrastructure. If aid finances public health care, governments in developing economies may feel they don’t need to set up efficient tax collection and spend money – as they can rely on foreign aid. This is damaging for the long-term. For example, the Gates Foundation has been criticised for its decisions to target single diseases (such as Polio eradication) – whilst this is a laudable aim, it has also led to the neglect of basic healthcare provisions, but encouraged a more fragmented private system. Global Justice has been critical of the Gates Foundation for using aid to promote a particular economic ideology. “There is extensive evidence that the promotion of markets in healthcare leads to an increase in health inequities and inefficiencies.” Global Justice report on Gates Foundation, 2016. Supporters of free trade usually support free market reforms to reduce the role of government interference and allow market forces to encourage innovation, efficiency and increased economic output. Policies to support free trade may involve. Privatisation of inefficient state owned industries. Lower corporation and income taxes to increase the incentive to invest in export industries. Infant industry argument. Developing countries may not be in a position to benefit from free trade. For example, their comparative advantage may lie in primary products which are subject to fluctuating commodity prices. The infant industry argument suggests that developing countries may benefit from temporary tariff barriers as the new industry develops. Aid can help overcome capital shortages and crippling debt payments. The Harrod Domar model of growth suggests that increasing capital is an effective way of increasing the rate of economic growth. For developing economies stuck in a cycle of low growth and low savings, aid can help break the negative cycle. Benefits of free trade are not always equitably distributed. Aid can enable assistance to areas of the economy that have missed out. For example, retraining for those who are geographically or occupationally immobile. Market failure can lead to an underprovision of important infrastructure such as education and infrastructure. Aid can help overcome these areas of market failure and help the economy to grow at a faster rate. Aid needed in emergencies. At various times, international aid has helped to rebuild countries and regions recovering from shock. For example, the Marshall Plan for Western Europe – post-Second World War. Foreign aid to help with humanitarian crisis. Both aid and free trade have the capacity to improve economic welfare. 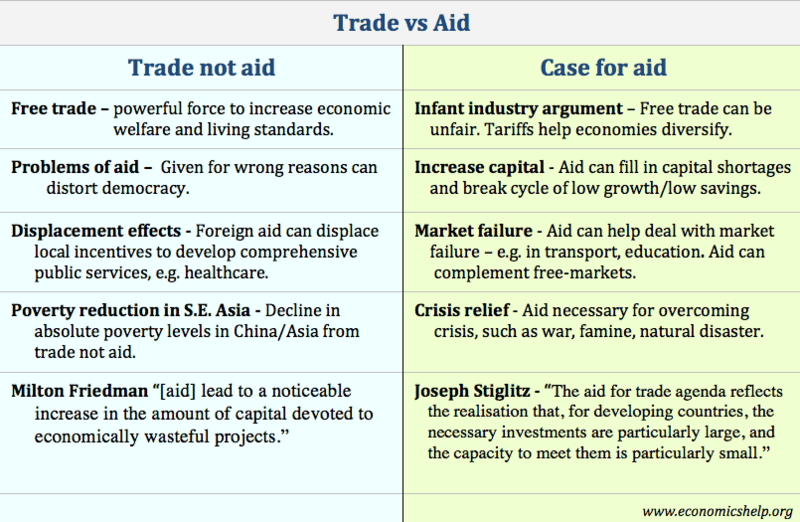 It is not so much trade vs aid – but what quality and type of aid is given. Does it complement government efforts to extend public support? Does it help overcome market failure and improve access to global trade markets. Free trade can also play a role, that aid cannot match. Trade and economic development are ultimately the goal as they enable countries to be self-sufficient. But, thoughtful aid can accelerate this process.